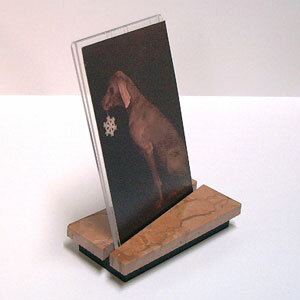 Rectangular Photo Frame in Terra Cotta Marble: A rich marble stand for your photos! This beautiful Marble comes in a rich orange-brown coloring. The surface has a multitude of natural variations within it. This richly colored base holds a simple 4"x6" photo frame. FREE SHIPPING! Orders over $100 receive free Ground shipping. We're located in Philadelphia. Orders in the Northeast often arrive within 1-2 business days. West Coast orders take roughly 5 business days. QUESTIONS? info@ArchitectsTouch.com or 215-875-9441 (M-F, 9-5 EST).